©2013 Museum Tinguely, Basel, Kehrer Verlag Heidelberg Berlin, authors [translators], artists, and photographers. With the special exhibition “Métamatic Reloaded”, Museum Tinguely presents ten art projects by both internationally renowned and up-and-coming young artists who make reference to one of Jean Tinguely’s most important inventions: his drawing machines, called Méta-Matics. Marcel Duchamp’s particular delight in these machines was no coincidence—after all, they radically questioned the process of artistic production and reception. Suddenly, a machine is producing art in the style of Abstract Expressionism or Tachisme, and roping in the beholder as a collaborator to do so. Though the machine retains sculptural and kinetic qualities, nevertheless in its own, motorized, often richly gestured act of creation it at the same time leaves behind a trace of individual drawing. Just as much as Tinguely’s inspiration, we have a special private initiative to thank for the exhibition. Natascha and Allard Jakobs, spouses and collectors from the Netherlands whose path to art was influenced early on by experiencing a Tinguely exhibition, founded the Métamatic Research Initiative four years ago, which then, in an open call for entries, invited submissions of projects in the example and spirit of Tinguely’s drawing machines. Managed by Siebe Tettero, this led to the selection of eight projects from around 300 entries, along with two direct invitations. They have been realized in recent years and can now be seen together for the first time. 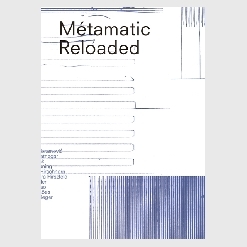 What the “Métamatic Reloaded” artists have come up with in their newly created works is hardly to be outdone in terms of diversity of inspiration and interpretation. Once again it is shown that the renegotiation of the possibilities of artistic creation and reception, as it took place in around 1960, is still infectious. The fact that Tinguely is inscribed in this history makes up the continued topicality of many of his ‘inventions’ to this day, which is why updating important themes and achievements of his oeuvre is a central concern for our museum. Beyond that, though, the diversity of the projects that we present with “Métamatic Reloaded” can also be read as a What’s What of a broadened concept of art around 1960 which tried to separate itself from institutionalized and ideological concepts: this is about body-related art forms, actions and happenings, sound art, video and film—interactive art, which only unfolds and comes into being at the site of its performance, with and through the beholder, participant and co-shaper.